HURAH visits Tent Cities for Internally Displaced Persons | HURAH! 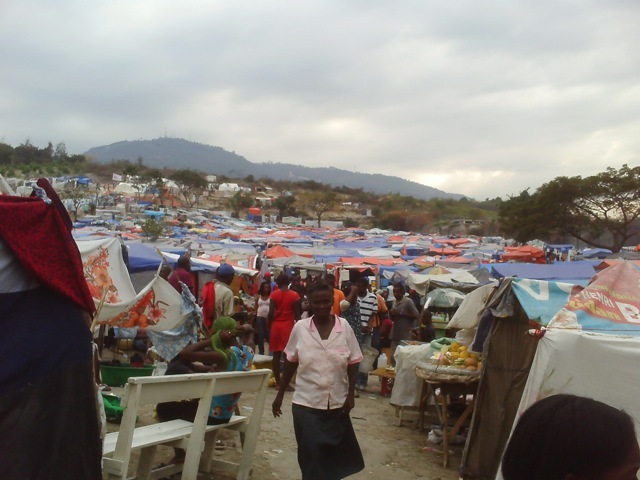 HURAH visited several of Port-au-Prince’s tent cities, temporary home now to hundreds of thousands of displaced Haitians. It should become clear from these photos that these camps are not a permanent solution. HURAH is advocating for a massive civilian relocation project, and is working with several partners to to establish a new community at Galette Chambon in the countryside for at least some of these people. 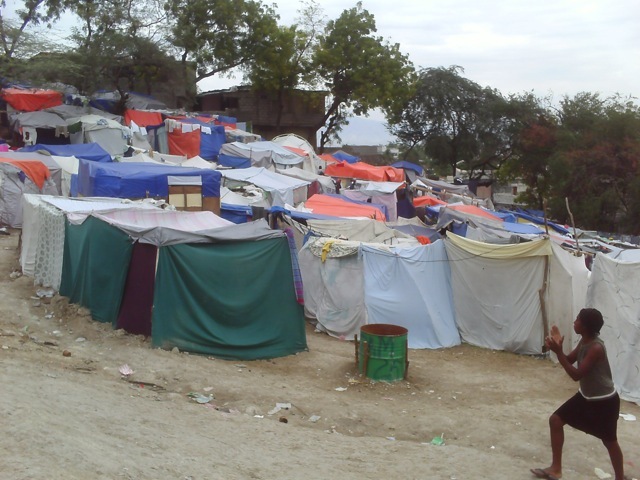 Overcrowding in Port-au-Prince was overwhelming before the earthquake, and the quake has added new energy to efforts like HURAH’s Sustainable Investment and Human Rights in Haiti project (SIHRH). 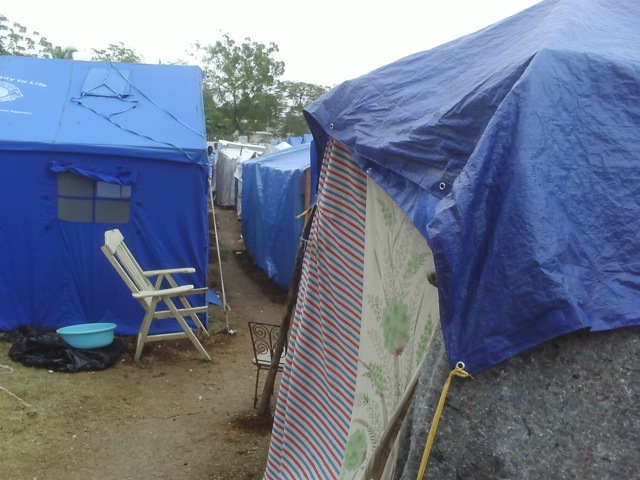 First up is Mathew 25, a tent city that is home to more than 1000 displaced Haitians. 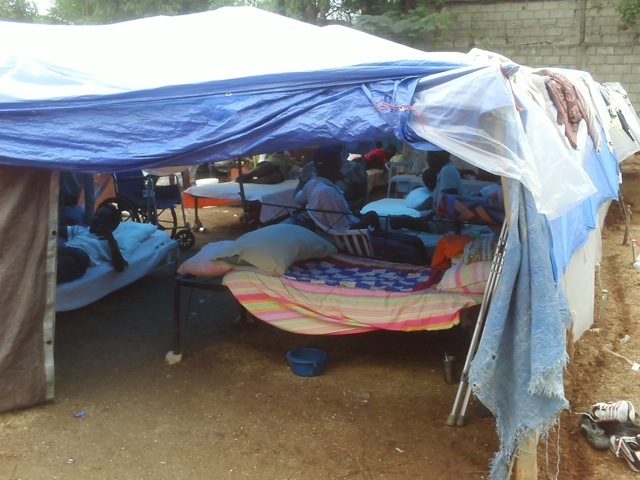 Matthew 25 has a small field hospital (below), but no functioning toilets yet. The International Lions Club provided most of the tents. Of course, the dilemma is that the more that facilities are developed with amenities, the more likely its residents are to want to stay. How do you provide immediate relief services to people in desperate need without encouraging permanent settlement? Simply moving shantytowns from one part of the city to the other is not a long-term solution. 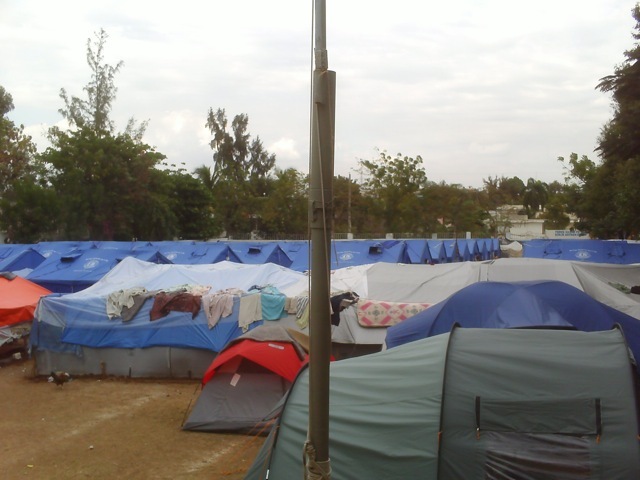 Next HURAH visited the tent city that arose on the grounds of the Pétionville Golf Club. This tent city grew from some of the first aid airdrops from the 82nd Airborne soon after the quake. Built on a hillside, more than 60,000 people live here now. These photos truly cannot convey the sprawling nature of this encampment. 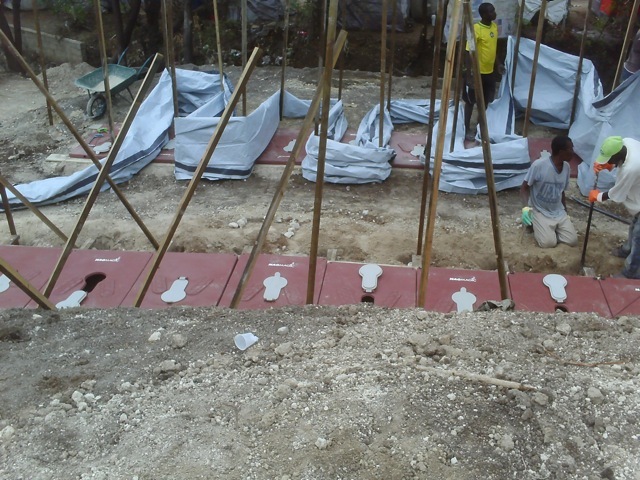 The Pétionville camp is run by Catholic Relief Services, and they have begun to install basic services like the latrines below. However, the entire encampment is built on a hillside, and when the spring rains come, one can only imagine what the conditions will be like. 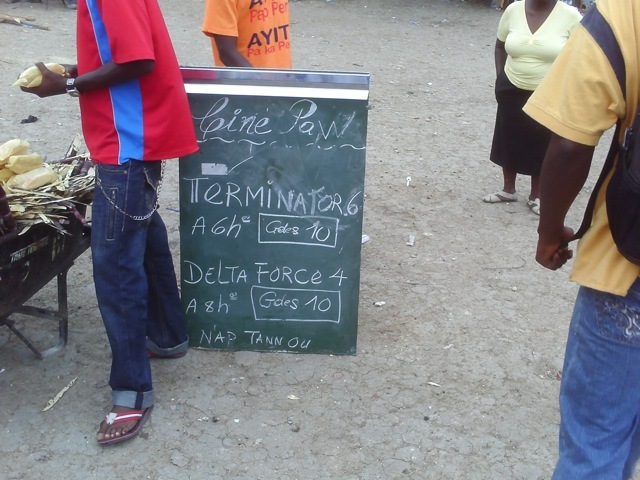 In spite of the conditions, Haitians are still able to manage to keep up their spirits, they have even built a cinema to distract from daily deprivations.